Find quality night vision optics for defense applications at SyntecOptics.com. From night vision goggles to night vision cameras, we offer optical solutions for all your night vision applications. It was during World War II that the development of night vision systems really took off. It has now become a critical component of modern warfare. 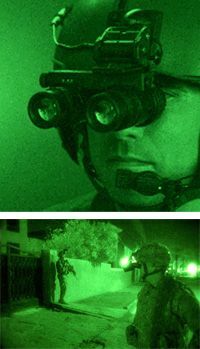 There are two distinct technologies that can be used in night vision: Image Enhancement (collects tiny amounts of light including the lower portion of IR spectrum, imperceptible to human eye, and amplifies it) and Thermal Imaging (captures upper portion of IR spectrum, emitted as heat by objects). Syntec Optics was commissioned to create the optical and opaque components to be used in an optoelectronics sub-assembly for a defense industry client. The subassembly was to be used for US Homeland Security. We utilized our Design For Manufacture (DFM) concepts to optimize the part geometries, then we engineered mold tooling and inspection fixturing. The optical and most opaque components were injection molded using our Arburg 28-ton injection molding machines. Many Larger opaque components were injection molded using our Toshiba 170-ton injection molding machine. The optical components were made from various material resins including Polyetherimide Ultem 1000 and Polycarbonate Lexan 121. The opaque components were made using various material resins including Nylon 6/6 and Polycarbonate Lexan 500. The subassembly had several components, and we worked within extremely tight tolerances during the manufacturing process. Following production, we performed profilometer and Coordinate Measuring Machine (CMM) data computation. With final approval through the Quality Assurance Department, we then quickly shipped the product to the client, who was very pleased with the success of each individual component used to make the optoelectronics sub-assembly. Defense Optics solutions by Syntec Optics are ideal for all your night vision needs. To learn more about this project, or for more information on our other products and services, please contact Syntec Optics.